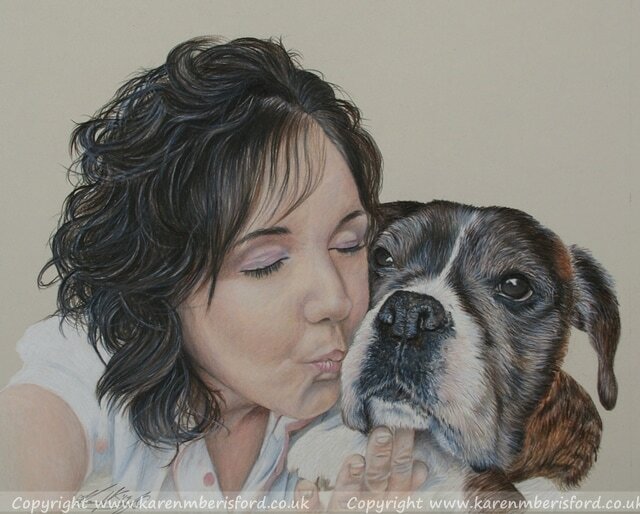 ​Sarah had commissioned me a couple of times to create 2 other portraits of her Boxer dogs, past & present and this portrait which shows herself & Bruno, who had passed away a few years ago, holds a very special place in her heart and wanted to commemorate her & Bruno's special bond. There were a few areas in the skin tones that I evened out such as the cheeks & nose area, as this was over exposed in the photograph - much of Bruno's white fur had been over exposed too so using other reference images was a great help to ensure I got the final portrait right. Layering all the colours that go in to make the skin appear realistic takes some time as I had to ensure the tones were built up correctly, in the correct sequence to encourage an easy blending process through to the final layers. Due to the possibility of the glass in a portrait frame getting damaged in transit, and as glass is not insured, as a rule I do not offer framing for my pencil portraits if they are to be posted out to a destination, however from time to time if a customer is prepared to take the chance I am happy to do this. Sarah wanted a matching frame with plaque to match her 2 previous portraits (see images at the bottom of this page) The framing was done by Brampton Picture Framing in my old birth town of Chesterfield when I visited in October, brought back home to Northumberland by myself and then posted out to Sarah after packing the portrait extremely well. I think this is a superb finish to a very special portrait. Here are other portraits that the Commissionee asked me to produce for her. All have been completed in Coloured pencils and Bruno (middle right) was the first portrait that I completed of him which gave me good practice for this second portrait. Please click on any of the images if you wish to find out more about the progress of these pieces and see how they came together too.